There is a ton of intriguing biology packaged up the diminutive Brown-headed Nuthatch. The nuthatch is one of three bird species found only in southern pinelands. The treetop antics and rubber ducky calls make these inquisitive birds a pleasure to watch, but declining population coupled with some interesting behaviors call for closer scientific attention. Like Florida Scrub-jays and Red-cockaded Woodpeckers, adult nuthatches often forego the chance to breed and instead help other adults raise young. Unlike woodpeckers and jays, this cooperative breeding among nuthatches frequently includes assistance provided to breeders that are not close relatives. This creates complex social arrangements with many intriguing twists and turns. Jim Cox heads up the Stoddard Bird Lab at Tall Timbers Research Station near Tallahassee. The lab has been studying a marked population of nuthatches for over 10 years as well as the relationships between controlled fires and the habitat needs of the many other declining bird species associated with southern pine forests. The Lab also is engaged in land conservation efforts that make use of special programs designed to conserve habitat for rare species on private lands. The programs typically reduce regulatory requirements by providing incentives that help landowners improve conditions for rare species. Join us on October 17th @ 6:30 p.m. for refreshments followed by the presentation at Swaim Memorial United Methodist Church, 1620 Naldo Ave., Jacksonville, FL. You’ve heard us talk about it before, but now it’s time to visit! Crosby Sanctuary, with over 500 acres of bottomland swamp and oak hammock, hides in the heart of suburban Clay County, Florida. Owned by Duval Audubon Society, this limited access nature preserve is home to a full biodiversity of native plants, mammals, birds, and reptiles and is now included in conservation lands mapping by Clay County and the Florida Natural Areas Inventory. A visit there provides respite amidst a busy, congested backdrop of human development. 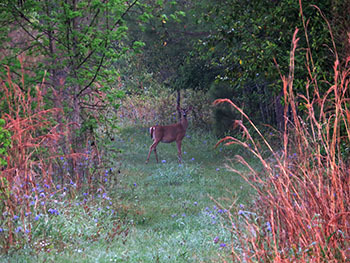 Just last week on our monthly field trip we saw 25 species of birds as well as 3 deer and a rabbit! Other times we’ve seen otter and gopher tortoise. Although not open to the public, field trips and work days are offered the fourth Saturday of every month (except December) from September to May at 8 a.m.; just show up at 427 Aquarius Concourse, Orange Park. Duval Audubon Society members, their families and friends also have access to this sanctuary through the Board members. Private tours for your group can be arranged by calling Sanctuary Director Pete Johnson at 904-536-4806 or DAS Vice President Carolyn Antman at 904-477-9807. See you there! Every year Auduboners from all over Florida meet to discuss the state of birding and the environment. It is an opportunity to go on field trips, and enjoy the company of like-minded people. It is a great way to recharge and be ready for migration season. The meeting is open to any member of Audubon Society. This year we will be at the beach in St. Petersburg, October 28-29. For more information and to register go to http://fl.audubon.org/about-us/audubon-assembly. Hope to see you there! Become a member of Duval Audubon! Not a member yet? Did you know that when you join Duval Audubon Society you are automatically registered with Audubon Florida and National Audubon Society? For one small annual membership fee ($20) you can belong to all three organizations and receive the Audubon Florida Naturalist magazine as well as Audubon, the publication of National Audubon. You can also receive ActionAlerts to make you aware of threats to birds across Florida and the country. Visit our website at www.duvalaudubon.org to join today!